Do you know Breast Cancer Awareness Month is coming up soon? Have you done your part? Do you contribute to local charities? Well now you can, while having fabulous skin at the same time! 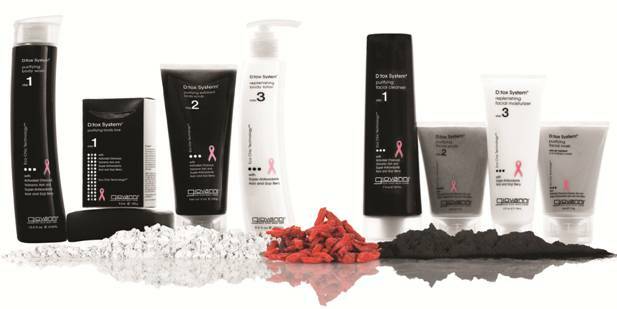 The Dtox line of body and facial products from Giovanni Cosmetics is an organic detoxifying regimen featuring charcoal and volcanic ash from the Mediterranean Sea in the volcanic arc of the Lipari Islands. These active ingredients delve into pores, absorbing the day’s toxins, impurities and excess oils that interfere with skin clarity. Better yet, Giovanni has donated $156,307.48 to the National Breast Cancer Foundation, Inc. from D:tox System® Body Care and D:tox System® Facial Care sales since 2008 and are continuing in its efforts for 2011. Traditional detox methods have generally targeted the inner body, extracting toxins for a healthier, more energetic body. However, our skin is the first line of defense against life’s stressful encounters and Giovanni’s D:tox System intends to ease the brunt while also striving for healthy and energized skin. Hand – harvested goji and acai, exotic super-antioxidants, nourish and rejuvenate, infusing skin with vitamins and minerals, re-establishing skin to its smoothest state. Skin will be soft to the touch and gently fragranced by essential oils of luscious fig and clean green tea. The D:tox System body line includes four products that are designed for systematic usage, giving skin a pure, natural and invigorating detoxification including Body Wash, Bar Soap, Body Scrub and Body Lotion. The facial line features a Purifying Facial Cleanser and Purifying Facial Scrub with volcanic ash and activated charcoal work to extract impurities and remove makeup without drying skin. Acai and goji berry help recharge and rejuvenate facial cells; Replenishing Facial Moisturizer contains maximum antioxidant power from green tea and fig, along with acai and goji berry, combined with high-performance hydrators to make skin feel soft, alive and restored; Purifying Facial Mask contains a higher percentage of charcoal and volcanic ash to extract the deepest impurities. I had the chance to check out the entire line, and not only is it really affordable, but it's helping out a really good cause. My favorite was the body wash, although I was a bit surprised when I lathered up it came out black, like a lava. It's a light ashy grey but felt great on my skin. The smell of all the products is a light acai berry with a bit of green tea. It's a fresh smell that won't last you a long time once you get out of the shower, but makes for a nice treat while using. I love the pretty pink breast cancer logo on each product, reminds me these beauty products are really going to help people out. The facial cleanser and lotion are also a nice affordable way to leave your skin feeling soft and also smelling great. I cant say enough great things about the whole lineup because it's made of natural ingredients that are great for your skin. If you're thinking about buying one or two products, I would recommend the body wash and body scrub, those are my personal favorite. I think the hubby likes them too, (since they are almost gone!) The facial cleanser is also a great way to sludge off dead skin cells and leave your face smelling oh so yummy! So if you haven't done your part yet in helping out with breast cancer research, head on over to Target and buy up the Giovanni Detox System. D:tox products are available at Target, Whole Foods and online at http://www.giovannicosmetics.com/ Prices are $9.95 each for all product except Purifying Body Bar $4.99.